Kroger's orange flyer lured us: a Moonlight Madness sale, costume contest, kid activities, treats all over the store. A frugal mama's dream, right? I dressed the kids and headed down the street. Only to find no costumes. No prizes. No sales different than what I saw that morning. And the treats? A single Tootsie Roll at the service desk. Lucky for Kroger, I caught this sweet moment in the calm before the storm. The things we will do in pursuit of FREE! Have you ever dragged your family on a frugal goose chase? Oooo... so frustrating. I can't think offhand of anything that turned into a complete goose chase... so many times, I've ventured to a local park, library or some such place with a "fun" event with my heart in my throat, hoping things will turn out well. Oh! Just thought of this - last Feb, my sister and I headed off to the Field Museum (Chicago) with my son b/c it was the last "free admission" week of the month and we wanted to try out the new Play Lab. Most of the museum is above a three-year-old, so the Play Lab sounded like a good idea. We arrived FIVE MINUTES after the Play Lab stopped admitting kids for the day. Oy. We went and looked at the stuffed animals, but it was not quite what we were anticipating. That's terrible. I always took my youngest to Kroger for this same event when she was little. I wonder if your Kroger is just not participating? Bummer and major disappointment for you and the kids. What sweetie pies. 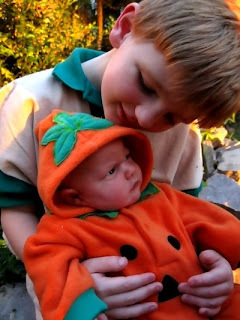 I don't know why but my favorite costumes on babies are pumpkins. I think it's because they are little pumpkins. Well now, that's just not nice. I'm sorry. Well, it was not a wild goose chase, but for my oldest son's first Halloween I dressed him up like a black cat. I made his outfit myself. He was so cute. I wanted his grandparents to see him. He was just 10 months old. At the time my parents owned and ran a place called Gene's Cue Club. (a bar with lots of pool tables) I went in with Jimmy all dressed up so he grandparents could see him. I sat with Jimmy at the end of the bar drinking a coke and chatting with my mother. Drunk after drunk came up to us and gave us money. (no one had any candy) I tried not to take the money as it was not at all what I had in mind..but my dad told me not to worry with it, take the money and use it for something for the baby. So I did, I thanked them all and I put the money (almost $100.00) into Jimmy's savings account. This was 1974 so $100.00 was alot of money. I still have the pictures of Jimmy dressed in his black cat suit. We were there less than an hour and he got so much. I was just so surprised. How frustrating! This summer, I told my sons we were going to Taco Bell for free tacos. However, my Taco Bell wasn't participating...so I had to fork over money for tacos, since the boys were excited about eating there :-). That's why I skipped the free taco on Tuesday! I hope you let them know! That's so bad. Only to find out that there was no signage, the checkers didn't know about it, and there wasn't a single flyer in the store with the "special sale" on it. The same thing happened to us but it was WalMart and Santa-games, candy, party, and a craft were advertised. We got there and no Santa, no candy, but they did give out a balloon. What a beautiful picture! Just precious. I'm sorry your outing was such a disappointment, now that's what I call misleading advertising! The manager at A&W felt sorry for me and gave us one, anyway. Then I felt REALLY bad! Meredith - our Kroger sent out the same flyer Tuesday for Wednesday and they didn't do any of the things they had listed either. Thankfully, I went alone since the kids are full of colds. We don't celebrate Halloween, but I was after the specials that weren't there and had to pick up some meds anyway. I'm sorry the kids had a disappointment, but I'm sure you used it as a good teaching tool. My kids still remember an event that was so completely not as advertised - they were on the verge of tears, but some passing angel gave me a nudge (shove) and reminded me that life is full a disappointments and we need to teach them at a young age to choose a Christ like attitude when dealing with them. Thankfully they made the best of it, but have resolved that they will always be careful not to make promises that they don't intent to keep. Our son remembers that he is to be a 'man of his word' and our daughter often thinks of that time as the day she determined never to hurt childrens' feelings. I think that you ought to email the corporate office, and send along the cute pictures of your kids, and tell them how disappointed you and the kids were with this event. I think that these stores that advertise these events ought to be held accountable for what they advertise. I think that if more moms did this (and it doesn't have to be done in a mean way), I think you'd see stores, etc. that are more likely to honor their commitments. Just my two cents. If you do write, Meredith, you ought to give them a link to this blog post so that they can read all the comments of moms who are similarly frustrated by "events" that turn out to be non-events like this! We've had several trips that didn't turn out as planned, but I can't imagine getting the kids amped up for something that turned out to be nothing. That had to be hard for them to understand. That is the sweetest photo of the brothers! i hope you complained. i feel your pain, because, yes, i have been there, done that! your boys are adorable and that photo is sweet! When my 16 year old was two I hauled him out of bed at 7:30 on a weekend!!! - hubby sleeping soundly - and drove him to the mall IN THE POURING RAIN because J.C. Penny had advertised that we could see Barney in person. I had visions of the big purple guy hugging my adoring boy. Barney was his special love and I knew it would be worth it. We joined a crowd of similarly excited kids and moms in the mall outside the store and were told to sit on the floor and wait to see Barney. They hauled out a TV set and turned on a Barney episode. We say Barney in person alright. We were there in person and Barney was on the TV. Could have done that at home with my own TV. How frustrating. You got a cute picture tho. ;) I don't know why but I am always more tired after I get fooled. This is why I loathe Kroger! I'm so sorry you went through this. I know Publix is having an event later today...check it out. We've also had our goose chases - stores completely out of sale items, etc. I'm sorry you had a bad time, but it is a cute picture! One particular event was a Kids Day at the mall. Dillard's had a very sad looking duck pond and we had to look all over to find it. However, this past year (I sent hubby with the kids not expecting anything) it was huge with a person making balloon animals (an EXPERT - made the 3-year-old a horse and the 5-year-old a crown using different color balloons and everything). Sometimes you just never know. I've had so many of these experiences that I've learned the hard way (over and over and...) not to say word one to the kids about what I'm expecting to happen. If it's a bust then no harm, no foul - I can usually think of something to make the outing "worth it" (throwing a penny each in the fountain to make a wish, window shop for next year's cleats, whatever). Often my downplayed expectations mean more delight for the kids since I haven't built anything up. I was once crestfallen at a local store's flop of a "kids' day" and they thought the whole thing was great. They'd had no idea it was on the day's agenda and were delighted by the serendipitous encounter. Now *that* was a huge lesson for me! That had to be frustrating! This has been an eye opener for me... in the olden days it seemed like the stores really did what they advertised... haven't had any little ones to participate in anything lately...but have lovely pictures of the grandchildren at all kinds of events given by different businesses... I guess the whole world has gone to speaking untruths? I second the love Publix, hate Kroger comment. In my neck of the woods, Kroger has lower prices, but it is worth it to me to shop in a clean, friendly store (Publix). We've gone to Publix several years in a row on Halloween and we've always been pleased with the little games, treats, and friendly employees. Bummer! And yes, I've dragged the kids out only to be disappointed. Now, if I'm not 100% sure that an event is going to happen I either don't tell my the kids or say that we *might* be doing x, y, or z. Just yesterday. There's a local farm that hosts Fall Harvest Days every year. It's been a family tradition but after yesterday--no more. I double checked the website to make sure they were still having it--corn maze, pick your own pumpkin, a play area filled with straw for the kids and hay rides. When we arrived there was a "closed" sign at the entrance. When I went into the gift shop to ask someone about it, the cashier told me "nobody was there so he just closed it." My response, "I don't think my six children and I are nobodies." I made sure I spoke to a supervisor and told her we'd be finding a new location to continue our yearly autumn tradition. I was so broke and a group of dentists offered free inspections in the elementary school for kids. They (the dentists) had dozens of kids sit in rows and went along the rows glancing into the kids mouths and scowling the whole time and then gave us their business card and told us to make an appointment. What a waste of time ! We went to Whole Foods, which had a lot put out, but all the games were 25 cents each, but the trick was you HAD to buy tickets from the register, which wasn't working, so the line was super long so the games were all empty and they didn't raise any money. My kinds enjoyed the goats someone brought to pet. THe treats they handed out in the store were all very healthy and my candy nut was WAY dissapointed. But we have gotten a lot of mileage from that in discussions.